Medellín (Spanish pronunciation: [meðeˈʝin]), officially the Municipality of Medellín (Spanish: Municipio de Medellín), is the second-largest city in Colombia and the capital of the department of Antioquia. It is located in the Aburrá Valley, a central region of the Andes Mountains in South America. According to the National Administrative Department of Statistics, the city has an estimated population of 2.5 million as of 2017. With its surrounding area that includes nine other cities, the metropolitan area of Medellín is the second-largest urban agglomeration in Colombia in terms of population and economy, with more than 3.7 million people. In 1616 the Spaniard Francisco Herrera Campuzano erected a small indigenous village (“poblado“) known as “Saint Lawrence of Aburrá” (San Lorenzo de Aburrá), located in the present-day El Poblado commune. On 2 November 1675, the queen consort Mariana of Austria founded the “Town of Our Lady of Candelaria of Medellín” (Villa de Nuestra Señora de la Candelaria de Medellín) in the Aná region, which today corresponds to the center of the city (east-central zone) and first describes the region as “Medellín”. In 1826, the city was named the capital of the Department of Antioquia by the National Congress of the nascent Republic of Gran Colombia, comprised by present-day Colombia, Venezuela, Ecuador and Panama. After Colombia won its independence from Spain, Medellín became the capital of the Federal State of Antioquia until 1888, with the proclamation of the Colombian Constitution of 1886. During the 19th century, Medellín was a dynamic commercial center, first exporting gold, then producing and exporting coffee. At the beginning of the 21st century the city regained industrial dynamism, with the construction of the Medellín Metro commuter rail, liberalized development policies, improved security and improved education. Researchers at the Overseas Development Institute have lauded the city as a pioneer of a post-Washington consensus “local development state” model of economic development. The city is promoted internationally as a tourist destination and is considered a global city type “Gamma -” by GaWC. 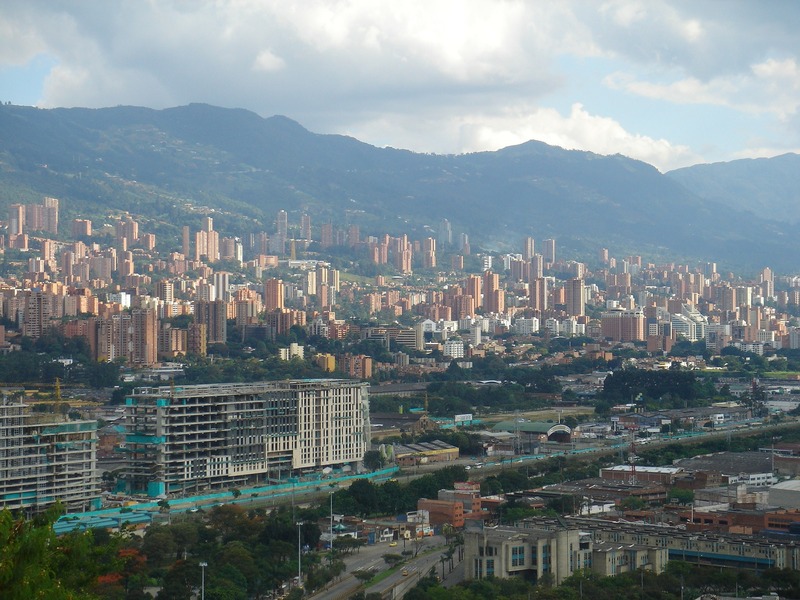 The Medellín Metropolitan Area produces 67% of the Department of Antioquia‘s GDP and 11% of the economy of Colombia. Medellín is important to the region for its universities, academies, commerce, industry, science, health services, flower-growing and festivals. In February 2013, the Urban Land Institute chose Medellín as the most innovative city in the world due to its recent advances in politics, education and social development. In the same year, Medellín was announced as the preferred corporate business destination in South America, and won the Verónica Rudge Urbanism Award conferred by Harvard University to the Urban Development Enterprise, mainly due to the North-Western Integral Development Project in the city. In September 2013, the United Nations ratified Colombia’s petition to host UN-Habitat’s 7th World Urban Forum in Medellín, from April 5–11, 2014. The most recent survey on the global status of the Smart Cities by Indra Sistemas catalogs Medellín as one of the best cities to live in South America, sharing first place with Santiago de Chile, and alongside Barcelonaand Lisbon in Europe. Medellín won the Lee Kuan Yew World City Prize 2016. The award seeks to recognize and celebrate efforts in furthering innovation in urban solutions and sustainable urban development.